If you already own a Cloud Mount system, these are the components to upgrade to the Slingshot configuration. The Cloud Mount Slingshot builds on the incredible versatility of the Cloud Mount system by adding a configuration tailored for underslinging your camera/gimbal combination. The new elastic suspension components provide excellent vibration isolation performance for more demanding applications while maintaining the simplicity and practicality that RigWheels in known for. Just like the standard Cloud Mount configurations, the Slingshot is fully adjustable and scaleable for use with a small gimbal and camera all the way up to full cinema packages using a monster like the Movi XL. Simply change the length/diameter of the cables and/or elastic tubing to tailor the mount to the size of your camera setup and the terrain you’ll be operating on. Tubing and cables are both available in 3 different diameters. 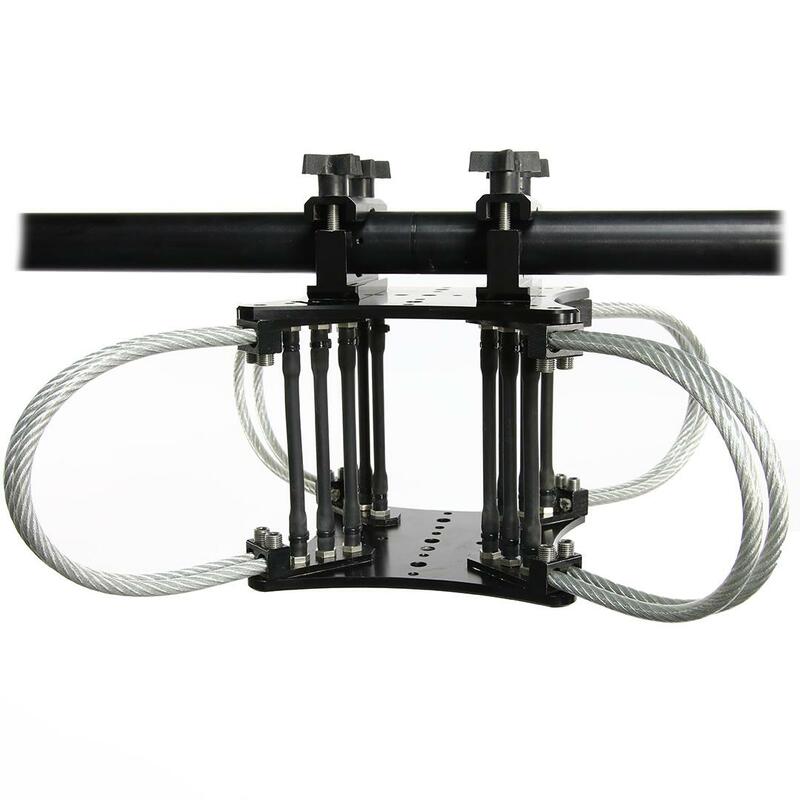 The elastic tubing is fastened to the system using our stainless steel tube connectors. These come with a variety of threading options so they can be placed in many different positions around our mounting plate as well as used with other rigging accessories. The standard positions for the tube mounts are where the Cloud Mount cables clamps are attached to the plate via 1/4-20″ screws. If you already own a Cloud Mount system you can easily upgrade by adding the Slingshot components. Upgrade options are available in the drop-down menu. If you don’t yet own a Cloud Mount get the most out of your system by ordering the complete system including the standard configurations. The Slingshot produces great results but the speed and ease of use of the standard Cloud Mount is essential to have in your arsenal. In many locations you are not able to mount a system which hangs to the outside footprint of your vehicle. The hood/roof/trunk placements of the Cloud Mount are ideal for these scenarios. Like all RigWheels systems the components of the Cloud Mount and Slingshot can be used in many other ways further increasing their net value. When you’re not using the system as a vibration isolator you can use the components as hard mounts etc… If you really want to be efficient with the gear you travel with RigWheels in an excellent choice. In one small case you can carry components to configure our RailDolly, Cloud Mount, Slingshot, RigMount X, RigMount XL, RigSkate and more. In addition to the Slingshot we are also releasing a comprehensive, modular, and scaleable tube mounting system for RigWheels systems as well as products from other manufactures that require a tube or “speed-rail” structure for mounting to a vehicle. These types of speed-rail structures are typically made-to-measure and are not portable. Cinestrut provides a first of its kind solution for a portable tube structures specifically designed for the film/video industry. The tubing and connectors shown in the Slingshot demo video are from the the first run of of test parts and we were still using some third-party hardware on some of the mounting points. Visit the Cinestrut page to learn more about the complete range of options.